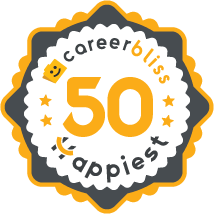 On average, employees at Cognizant give their company a 3.9 rating out of 5.0 - which is 3% higher than the average rating for all companies on CareerBliss. The happiest Cognizant employees are QA Analysts submitting an average rating of 4.6 and Senior Java Developers with a rating of 4.5. "Cognizant is a good company to work with. But with its business growing, they have to focus on growth of employees as well. Cognizant has a strong leadership focused towards growth of organization. Company has an excellent reputation for initiating visas and green card for its employees." "I have worked for CTS for 3 months and found it to be a very good company. Employee friendly and process driven." "Excellent company to work with." "I have worked in Cognizant for the past 5 years." "I have worked for cognizant technology solutions for the past 6.5 years and have enjoyed and learnt a lot of new technologies along the way." "Its a good company to work for." "i have worked at cognizant technology solutions since 2010. Cognizant is a leading provider of information technology, consulting, and business process outsourcing services. Cognizant’s single-minded passion is to dedicate our global technology and innovation know-how, our industry expertise and worldwide resources to working together with clients to make their businesses stronger. With over 50 global delivery centers and more than 85,500 employees as of March 31, 2010." "Good company to start your career. Excellent policies and fuels your career growth if you stick to the company. However does not pay much attention towards your personal interest. Work life balance depends on the project you are tagged with. Good place to work with and will recommend for everyone." "Cognizant gave me a great opportunity bringing me to US and assigned me to the best company in the bay area. But it has very low opportunities to grow and salary is way below the market." "Good place to work and had a good opportunity to grow." "I've worked at Cognizant since 2006. The place has nurtured me from an entry level trainee to a passionate developer who loves challenges and a great mentor! However, the quality of incoming talent has been drastically falling down. Now, the middle management has lost all sheen and we have very few people to look up to and learn from. The company has moved away from thinking about employee personal development." "It's a good company to start the career." "It's a good company to work with." "I have worked with Cognizant for two years. It's a good workplace to learn and share your knowledge." "Great company to learn and grow professionally." "It is good company to work for."